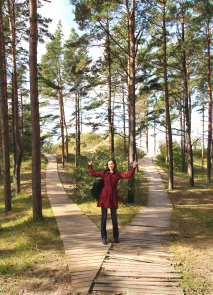 The botanical garden in Palanga is one of the prettiest in Lithuania's seaside area. The garden is very popular with nature lovers, families, weddings and romantic souls. 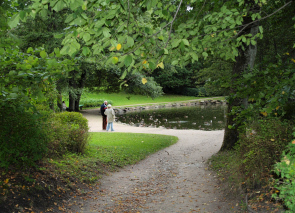 Every time we are in Palanga we take a stroll down the Lovers’ Lane (Meiles aleja Street) that takes you to the botanical garden in Palanga. As you peacefully stroll down you can hear the sound of the sea as this path goes parallel to the sea. 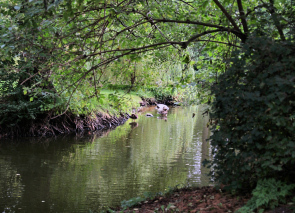 As you walk through the botanical garden you will enjoy idyllic scenes of pretty ponds and flocks of white swans. You will also see beautiful flower arrangements, clusters of different species of trees, gazebos, elegant sculptures and fountains. 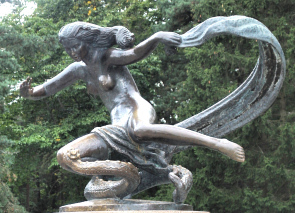 (Photo above: A sculpture of Egle – Queen of the Grass Snakes (character coming from Lithuanian mythology) is one of Lithuania’s best 20th century decorative sculptures. Originally the garden was founded in 1887 by Count Felix Tiskevicius. In 1902 French landscape architect Eduard Francois Andre and his son designed the park outfitting it with several ponds, trees brought from different European botanical gardens, lawns, rosebushes and fountains. 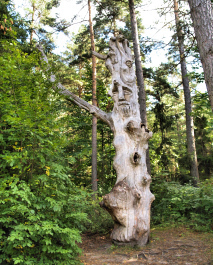 Close to Birutes hill you will find Palanga Amber Museum, formely the Tyszkiewicz manor. This neo-renaissance palace was built the same year as the botanical gardens. A bronze lion guarding the manor house steps and the statue of “Christ Blessing” are popular photographed sights with visitors.